Dna - It occurs inside the nucleus of cell and some cell organelles but it plants it is present in mitochondria and plant cell. Rna - It is found in cytoplasm of the cell but very little is found inside the nucleus. Dna - It is a double-stranded molecule consisting of a long chain of nucleotides. Rna - It is single-strand helix having shorter chains of nucleotides. Dna - It stores and transfers genetic information to generate new cells and organisms. Rna - It is used to transfer genetic code from nucleus to the ribosomes to make proteins and carries DNA blueprint’s guidelines. Dna - It has two nucleotide strands consisting of phosphate group, five carbon sugar (stable deoxyribose 2) and four nitrogen bases. Rna - It is single stranded consisting of phosphate group, five carbon sugar (less stable ribose) and four nitrogen base. Rna - Here nitrogen base pairs are Adenine links to Uracil (A-U) and Cytosine links to Guanine (C-G). Rna - It is synthesised from DNA when needed. Dna - The DNA helix geometry is in the form of B and can be damaged by exposure of ultra-violet rays. Rna - The RNA helix geometry is in the form of A. It is more resistant to damage by ultra-violet rays. Dna - It is a long polymer chain. Rna - It is shorter polymer. Dna - DNA produces regular helix i.e. it is a spirally twisted. Rna - It produces secondary helix or pseudo helix as its stranded may get folded at places. Dna - It occurs in the form of chromosomes or chromatin fibres. Rna - It occurs in ribosomes or forms association with ribosomes. Dna - Quantity of DNA is fixed for cell. 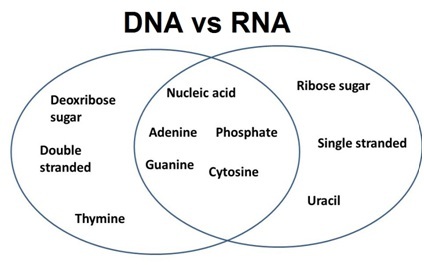 Rna -The quantity of RNA for a cell is variable. Dna - It is of two types: intra nuclear and extra nuclear. Rna - It is of four types: m-RNA, t-RNA and r-RNA. Dna - Life of DNA is long. Rna - Its life is short. Some RNA’s have very shorter life but some have longer but in all its life is short. Dna - After melting its renaturation is slow.